One of the most prominent temples in Bagan, the Ananda Temple and Ananda OK Kyaung is heavily touristed throughout the year. 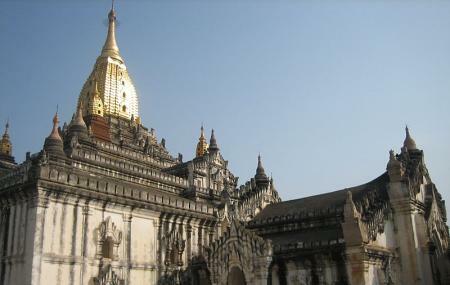 A Buddhist temple built in 1105 AD, the person behind Ananda Temple was King Kyanzittha of Pagoda Dynasty. With a perfect amalgamation of Mon and Indian architecture, the Ananda Temple is said to be a manmade marvel. Also known as the veritable museum of stones, this one is a highly revered temple in Bagan and should be on the top of your priority list! How popular is Ananda Temple? People normally club together Tharabar Gate and Shwegu Gyi Phaya while planning their visit to Ananda Temple. A truly majestic and divine temple of Buddha. The Archaeological Survey of India has done a splendid job of restoration after the temple was damaged by earthquake. The chemical restoration process has brought back the pristine brilliance of this sprawling structure. There are many bells around the complex that one can sound. A totally fulfilling visit. One of the historical places to visit in Bagan. Very big template with very rich wall painting and stuffs. But prepare to go early since they close at 8pm. Well known temple of Bagan, very calming. The entrance is not very interesting though but you will find it beautiful inside. Nice architecture. There is a huge standing statue of Budhdha. There is no entry tickets required. At the netract you have to cross several small souvenir shops which mail sell traditional items. Every visitor to Bagan should not miss to visit and learn its history.